The second season of The Eighth Doctor Adventures has so far been a more lighthearted affair that the first, though the imagination and drama on display has certainly been just as strong as Paul McGann and Sheridan Smith continue to hone their characters’ fantastic relationship. 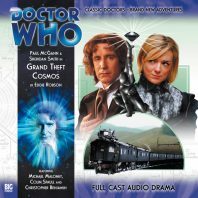 That trend continues in Eddie Robson’s ‘Grand Theft Cosmos’ as the Doctor and Lucie visit nineteenth-century Sweden and quickly become entangled in an attempt to steal Claudia Tardelli’s famed Black Diamond by none other than the mysterious Headhunter and her new associate, Karen. Eddie Robson has quickly cemented himself as one of Big Finish’s most reliable writing talents, and following his superb two-part Cybermen finale to round out this range’s first season it’s fair to say that his voice best exemplifies everything this version of the Eighth Doctor is and everything this series is trying to achieve. McGann’s Doctor is at his most exuberant here, his genuine excitement at having the opportunity to steal Tardelli’s work shining through as he eventually explains his continuing quest throughout time to destroy the alien pieces that have the ability to warp the very fabric of time and space. Indeed, the rapport and chemistry between the two leads is at its best here, all the more impressive given the fact that McGann and Smith were not able to record together for this story, and Lucie is able to throw herself squarely into the middle of events with remarkable aplomb in a very proactive and productive outing. It’s fitting that Robson should be the one to bring back Katarina Olsson’s exasperated Headhunter and Louise Fullerton’s enthusiastic but more naïve Karen as well, and the accidental and very casual bumping into between Karen and Lucie to set events in motion is played spectacularly well. With an escape from a speeding train onto horseback, assumed identities, and hypnotism which all bring out just as many comedic moments as dramatic, the re-emergence of this strange duo is very welcome and by itself puts a very unique twist on the traditional heist formula as both groups find themselves going after the Black Diamond for wholly different reasons. Yet with plenty of offhanded technobabble, an intriguing silicon-based monster, and a self-contained universe that is spilling out of its confines and threatening the destruction of everything, Robson instills plenty of science fiction elements to make it fit perfectly within the loose boundaries of what is expected in a Doctor Who tale. Indeed, the only real quibble with ‘Grand Theft Cosmos’ is that its comedic stylings do ultimately overtake what are meant to be the more serious components, meaning that the ultimate threat doesn’t carry quite as much weight as probably intended. Nonetheless, this is a fine example of just how versatile the franchise is as a whole, and each and every performer rises to the occasion wonderfully. With the typical strong direction of Barnaby Edwards who maintains a blistering pace and energy and the usual strong sound design that expertly amplifies the emotion and actions throughout, this is another strong release in this second season and certainly keeps the momentum going as the second season finale quickly begins its approach.